"Wusi" redirects here. For other uses, see WUSI. The May Fourth Movement (Chinese: 五四运动; pinyin: Wǔsì Yùndòng) was an anti-imperialist, cultural, and political movement which grew out of student participants in Beijing on 4 May 1919. They protested against the Chinese government's weak responses to the stipulations of the Treaty of Versailles, especially it allowing Japan to receive territories in Shandong, which had been surrendered by Germany after the Siege of Tsingtao in 1914. China had fallen victim to the expansionist policies of the Empire of Japan, which had conquered large areas of Chinese-controlled territory with the support of France, the UK, and the US. This was finalized at the Treaty of Versailles. The demonstrations sparked national protests and marked an upsurge of Chinese nationalism, a shift towards political mobilization and away from cultural activities, and a move towards a populist base rather than intellectual elites. Many of the radical political and social leaders of the next two decades emerged at this time. The term "May Fourth Movement" in a broader sense often refers to the period during 1915–1921 more often called the New Culture Movement. "The atmosphere and political mood that emerged around 1919," in the words of Mitter (2004), "are at the centre of a set of ideas that has shaped China's momentous twentieth century." Following the Xinhai Revolution in 1911, the Qing dynasty disintegrated. This marked the end of thousands of years of powerful imperial rule, and theoretically ushered a new era in which political power rested with the people. However, the reality was that China was a fragmented nation dominated by warlords, who were more concerned with their own political powers and private armies than national interests. The Chinese Beiyang government was occupied with suppressing internal affairs and did little to counter the influence exerted by foreign powers. The March 1st Movement that happened in Korea in 1919, the Russian Revolution of 1917, defeats by foreign powers and the presence of spheres of influence inflamed a sense of Chinese nationalism among the emerging middle class and cultural leaders. Leaders of the New Culture Movement believed that traditional Confucian values were responsible for the political weakness of the nation. Chinese nationalists called for a rejection of traditional values and the selective adoption of Western ideals of "Mr. Science" (賽先生; 赛先生; sài xiānsheng) and "Mr. Democracy" (德先生; dé xiānsheng) in place of "Mr. Confucius" in order to strengthen the new nation. These iconoclastic and anti-traditional views and programs have shaped China's politics and culture down until the present. return to China of the territory and rights of Shandong, which Japan had taken from Germany during World War I. The Western Allies dominated the meeting at Versailles, and paid little heed to Chinese demands. Britain and France were primarily interested in punishing Germany. Although the United States promoted Woodrow Wilson's Fourteen Points and the ideals of self-determination, they were unable to advance these ideals in the face of stubborn resistance by David Lloyd George, Georges Clemenceau and the U.S. Congress. American advocacy of self-determination at the League of Nations was attractive to Chinese intellectuals, but their failure to follow through was seen as a betrayal. Chinese diplomatic failure at the Paris Peace Conference touched off the May Fourth Movement, and became known as the "Shandong Problem". to oppose the granting of Shandong to the Japanese under former German concessions. to draw awareness of China's precarious position to the masses in China. to recommend a large-scale gathering in Beijing. to promote the creation of a Beijing student union. to hold a demonstration that afternoon in protest to the terms of the Treaty of Versailles. Protestors dissatisfied with the Treaty of Versailles for China. Tsinghua University students burn Japanese goods. Students of Beijing Normal University who arrested by government at the May Fourth Movement. On the afternoon of May 4 over 4,000 students of Yenching University, Peking University and other schools marched from many points to gather in front of Tiananmen. They shouted such slogans as "Struggle for the sovereignty externally, get rid of the national traitors at home", "Do away with the 'Twenty-One Demands'", and "Don't sign the Versailles Treaty". They voiced their anger at the Allied betrayal of China, denounced the government's spineless inability to protect Chinese interests, and called for a boycott of Japanese products. Demonstrators insisted on the resignation of three Chinese officials they accused of being collaborators with the Japanese. After burning the residence of one of these officials and beating his servants, student protesters were arrested, jailed, and severely beaten. The next day, students in Beijing as a whole went on strike and in the larger cities across China, students, patriotic merchants, and workers joined protests. The demonstrators skillfully appealed to the newspapers and sent representatives to carry the word across the country. From early June, workers and businessmen in Shanghai also went on strike as the center of the movement shifted from Beijing to Shanghai. Chancellors from thirteen universities arranged for the release of student prisoners, and Cai Yuanpei, the principal of Peking University resigned in protest. Newspapers, magazines, citizen societies, and chambers of commerce offered support for the students. Merchants threatened to withhold tax payments if China's government remained obstinate. In Shanghai, a general strike of merchants and workers nearly devastated the entire Chinese economy. Under intense public pressure, the Beijing government released the arrested students and dismissed Cao Rulin, Zhang Zongxiang and Lu Zongyu. Chinese representatives in Paris refused to sign the peace treaty: the May Fourth Movement won an initial victory which was primarily symbolic, since Japan for the moment retained control of the Shandong Peninsula and the islands in the Pacific. Even the partial success of the movement exhibited the ability of China's social classes across the country to successfully collaborate given proper motivation and leadership. For many years, the orthodox view in the People's Republic of China was that after the demonstrations of 1919 and their subsequent suppression, the discussion on possible policy changes became more and more politically realistic. People like Chen Duxiu and Li Dazhao shifted more to the left and were among the leading founders of the 1921 Communist Party of China, whilst other intellectuals, such as the anarchist writer and agitator, Ba Jin also took part in the movement. Originally voluntarist or nihilist figures like Li Shicen and Zhu Qianzhi made similar turns to the Left as the 1920s saw China become increasingly turbulent. The May Fourth Movement served as an intellectual turning point in China; it was a seminal event that radicalized Chinese intellectual thought. Western-style liberal democracy had previously had a degree of traction amongst Chinese intellectuals, but after the Versailles Treaty (which was viewed as a betrayal of China's interests), lost much of its attractiveness. Woodrow Wilson's Fourteen Points, despite being rooted in moralism, were also seen as Western-centric and hypocritical. Many in the Chinese intellectual community believed that the United States had done little to convince the imperialist powers (especially Britain, France, and Japan) to adhere to the Fourteen Points, and observed that the United States itself had declined to join the League of Nations; as a result they turned away from the Western liberal democratic model. Marxism began to take hold in Chinese intellectual thought, particularly among those already on the Left. It was during this time that communism was studied seriously by some Chinese intellectuals such as Chen Duxiu and Li Dazhao. A monument of the May Fourth Movement in Dongcheng District, Beijing. 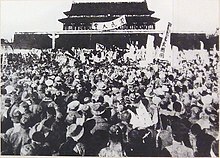 Scholars rank the New Culture and May Fourth Movements as significant turning points, along with the abolition of the civil service system in 1905 and the overthrow of the monarchy in 1911. Participants at the time, such as Hu Shi, referred to this era as the Chinese Renaissance because there was an intense focus on science and experimentation. The challenge to traditional Chinese values, however, was also met with strong opposition, especially from the Nationalist Party. From their perspective, the movement destroyed the positive elements of Chinese tradition and placed a heavy emphasis on direct political actions and radical attitudes, characteristics associated with the emerging Chinese Communist Party. On the other hand, the Communist Party, whose two founders, Li Dazhao and Chen Duxiu, were leaders of the movement, viewed it more favorably, although remaining suspicious of the early phase which emphasized the role of enlightened intellectuals, not revolution. In its broader sense, the May Fourth Movement led to the establishment of radical intellectuals who went on to mobilize peasants and workers into the Communist party and gain the organizational strength that would solidify the success of the Communist Revolution. Although the Movement was highly influential, many of the intellectuals at the time opposed the anti-traditional message and many political figures ignored it. Chiang Kai-shek, as a nationalist and Confucianist was against the iconoclasm of the May Fourth Movement. As an anti-imperialist, he was skeptical of western ideas and literature. He and Dr. Sun Yat-sen criticized these May Fourth intellectuals for corrupting morals of youth. When the Nationalist party came to power under Chiang's rule, it carried out the opposite agenda. The New Life Movement promoted Confucianism and the Kuomintang purged China's education system of western ideas, introducing Confucianism into the curriculum. Textbooks, exams, degrees and educational instructors were all controlled by the state, as were all universities. Some conservative philosophers and intellectuals opposed any change, but many more accepted or welcomed the challenge from the West but wanted to base new systems on Chinese values, not imported ones. These figures included Liang Shuming, Liu Shipei, Tao Xisheng, Xiong Shili, Zhang Binglin and Lu Xun's brother, Zhou Zuoren. In later years, others developed critiques, including figures as diverse as Lin Yutang, Qian Mu, Xu Fuguan, and Yu Yingshi. Chinese Muslims ignored the May Fourth movement by continuing to teach Classical Chinese and literature with the Qur'an and Arabic along with officially mandated contemporary subjects at the "Normal Islamic School of Wanxian". A Classical Chinese translation of the Quran was done by Ha Decheng. Arabic, vernacular Chinese, Classical Chinese, and the Qur'an were taught in Ningxia Islamic schools funded by Muslim General Ma Fuxiang. Although the May Fourth Movement did find partial success in removing Chinese traditional culture, there were still proponents who steadfastly argued that China's traditions and values should be the fundamental foundation of the nation. From these opponents of Western civilization derived three neotraditional schools of thought: national essence, national character, and modern relevance of Confucianism. Each school of thought denounced the western values of individualism, materialism and utilitarianism as inadequate avenues for the development of China. Each school held to specific objectives. The "national essence" school sought to discover aspects of traditional culture that could potentially serve the national development of China. Such traditional aspects consisted of various philosophical and religious practices that emerged parallel with Confucianism. Most particularly, China imported Buddhism, a religion from their neighboring countries, India and Nepal. Under the "national character" school, advocates promoted the traditional family system, the primary target of the May Fourth Movement. In this school, reformers viewed Westerners as shells without morals. Finally, the modern relevance of Confucianism was centered on the notion that Confucian values were better than Western ones. In response to western culture's primary concentration on rational analysis, China's neotraditionalists argued that this was misguided, especially in the practical, changing milieu of the world. Most importantly, these three neo-traditionalist thoughts gave no consideration to the individual, which was the main theme of the May Fourth Movement. ^ Rana Mitter. A Bitter Revolution: China's Struggle with the Modern World. (Oxford; New York: Oxford University Press, 2004), p. 12. ^ Leo Ou-fan Lee, Voices from the Iron House: A Study of Lu Xun (Bloomington: Indiana University Press, 1987), pp 53-77; 76-78. ^ Jonathan D. Spence. The Gate of Heavenly Peace: The Chinese and Their Revolution, 1895-1980. (New York: Viking Press, 1981), pp. 117-123 ff..
^ Guoqi Xu. Strangers on the Western Front: Chinese Workers in the Great War. (Cambridge, Massachusetts: Harvard University Press, 2011. ISBN 9780674049994), pp. 1-9, and passim. ^ a b c Wasserstrom, Jeffrey N. "Chinese Students and Anti-Japanese Protests, Past and Present". World Policy Journal. Retrieved November 18, 2008. ^ a b Hao, Zhidong. "May 4th and June 4th Compared: A Sociological Study of Chinese Social Movements". Journal of Contemporary China. Retrieved November 21, 2008. ^ Hu Shih, The Chinese Renaissance: The Haskell Lectures, 1933. (Chicago: University of Chicago Press, 1934). ^ a b Schoppa, R.Keith. Revolution and Its Past: Identities and Change in Modern Chinese History. Upper Saddle River, New Jersey: Pearson Prentice Hall. pp. 177–179. ^ Werner Draguhn, David S. G. Goodman (2002). China's communist revolutions: fifty years of the People's Republic of China. Psychology Press. p. 39. ISBN 0-7007-1630-0. Retrieved April 9, 2011. ^ Charlotte Furth, "Culture and Politics in Modern Chinese Conservatism," in Charlotte Furth, ed., The Limits of Change: Essays on Conservative Alternatives in Republican China. (Cambridge, Massachusetts: Harvard University Press, Harvard East Asian Series 84, 1976). ISBN 0674534239. ^ Stephane A. Dudoignon; Komatsu Hisao; Kosugi Yasushi (September 27, 2006). Intellectuals in the Modern Islamic World: Transmission, Transformation and Communication. Routledge. pp. 251–. ISBN 978-1-134-20597-4. ^ Stephane A. Dudoignon; Komatsu Hisao; Kosugi Yasushi (September 27, 2006). Intellectuals in the Modern Islamic World: Transmission, Transformation and Communication. Routledge. pp. 253–. ISBN 978-1-134-20597-4. ^ Stephane A. Dudoignon; Komatsu Hisao; Kosugi Yasushi (September 27, 2006). Intellectuals in the Modern Islamic World: Transmission, Transformation and Communication. Routledge. pp. 256–. ISBN 978-1-134-20597-4. Chow Tse-Tsung: The May Fourth Movement. Intellectual Revolution in Modern China (Cambridge, Massachusetts: Harvard University), 1960. Hao, Zhidong, "May 4th and June 4th Compared: A Sociological Study of Chinese Social Movements." Journal of Contemporary China 6.14 (1997): 79-99. Lee, Haiyan, "Tears that Crumbled the Great Wall: The Archaeology of Feeling in the May Fourth Folklore Movement." Journal of Asian Studies 64.1 (2005): 35-65. Ping, Liu, "The Left Wing Drama Movement in China and Its Relationship to Japan." Positions: East Asia Cultures Critique 14.2 (2006): 449-466. Schoppa, R. Keith, "Constructing a New Cultural Identity: The May Fourth Movement." Revolution and Its Past: Identities and Change in Modern Chinese History (Upper Saddle River, New Jersey: Pearson Prentice Hall), 2006, 162-180. Schwarcz, Vera: The Chinese enlightenment: intellectuals and the legacy of the May Fourth Movement of 1919 (1986). Berkeley: University of California Press. Spence, Jonathan D. The Search for Modern China. ISBN 0-393-30780-8 New York: Norton, 1999. Wasserstrom, Jeffrey N., "Chinese Students and Anti-Japanese Protests, Past and Present" World Policy Journal 22.2 (2005): 59-65. Zarrow, Peter, "Intellectuals, the Republic, and a new culture", in Zarrow, Peter: China in war and revolution, 1895-1949 (New York: Routledge), 2005, 133-143. Zarrow, Peter, "Politics and culture in the May Fourth Movement", in Zarrow, Peter: China in war and revolution, 1895-1949 (New York: Routledge), 2005, 149-169. May 4th 1919 Monument in Beijing — photos, directions, + background. Chinese Posters.net: "May Fourth Movement (1919)"
Chinese Posters.net: "Propaganda, Politics, History, Art" (Amsterdam University) — mostly post 1949 posters, and commentary.